Installment #2 in a series of posts on uses of the phrase Postcards from Wonderland. Rookie, the online website, claims to be a venue for teenage girls. The artist was a teenager in 2014, but she was no rookie. She painted scenes from a summer spent with her best friend’s family on Block Island off the coast of Rhode Island. The watercolors are captivating and evoke memories of my own travels though I’ve never visited Block Island. Emily reveals that she lives/lived in Oak Park, Illinois and is a lover of fish and little watercolor landscapes but nothing else. Seven of Emily’s watercolors are displayed. 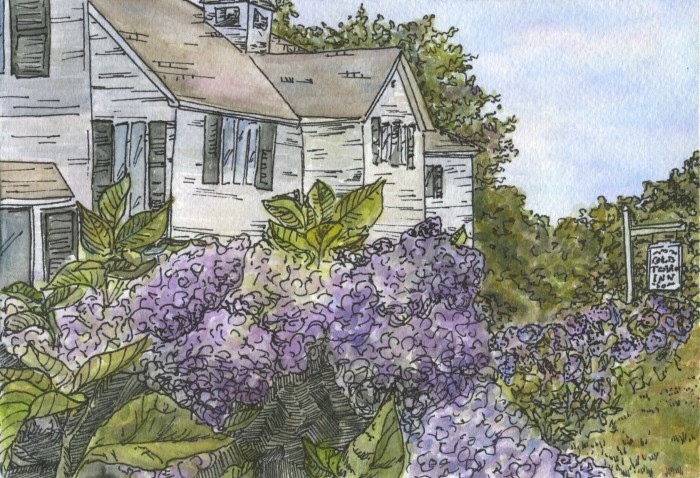 They include renderings of the ferry servicing Block Island, lobster buoys dangling from hooks on the side of Finn’s restaurant, and hydrangeas in full bloom alongside the Old Town Inn. From the moment I studied the muted colors, inked whorls, dots, and circles, and idyllic scenes, I’ve been desperately seeking Emily. I have yet to stumble on a promising lead. But I will keep looking, and half hope that this post will somehow find her and discover that she is painting still today. 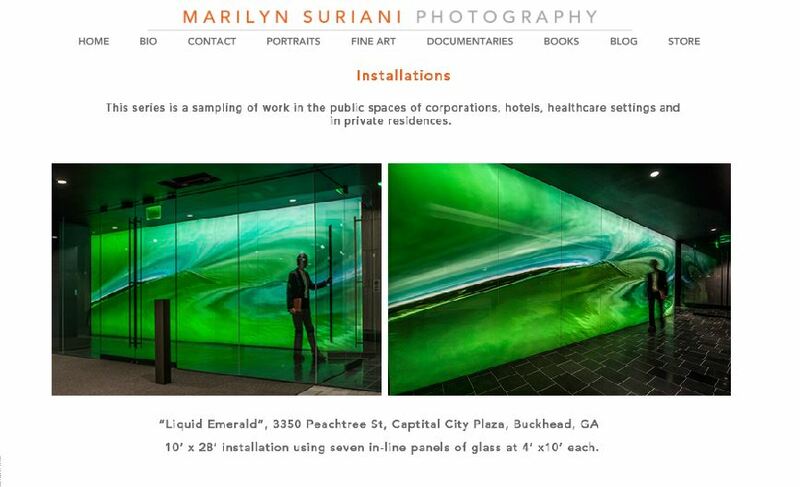 Marilyn Suriani announced a ground breaking photo installation — a super large photo displayed on glass at the Capital City Plaza in Buckhead (Atlanta, Georgia). There’s something entirely surreal about the installation, the emerald-hued photo of water transforms the otherwise sterile setting into an experience. Alette Simmons-Jimenez is (according to her website) a multidisciplinary artist and designer whose work in video, installation, painting, and sculpture draws inspiration from patterns in the environment. She has exhibited internationally and is the recipient of several grants and awards. And, yes, she is my sister. Like any other family, when we’re together, we spend a fair amount of time reminiscing. We’re often amazed at how different our memories of the past are. We’ll be laughing about a long ago experience and then one of us will mention something and the other will wonder what in the world they’re describing. We’ll have no recollection whatsoever of the event. It’s also refreshing to look at the different paths we’ve chosen, despite having shared a common heritage. My mother had a natural gift for the arts, acting, dancing, singing, painting in acrylic, oil, and watercolor, drawing in ink and charcoal, and interior design. To some greater or lesser degree, each of the four children in the family inherited her artistic abilities. As children, we drew or painted constantly, especially in the years before television. My efforts were most often slavish copies of magazine photos, my older sister made lovely pastel paintings, while Alette, the youngest, would mar the page with heavy dark lines. They slashed across the page, crossed over themselves, and spilled into the margin. She had absolute disregard for coloring between the lines (and even the edge of the page). I was too young at the time to understand how much more creativity filled one of those passion-driven, bold color strokes than in my entire rendering. Alette went on to study art and to dedicate herself to the art world, first in the Dominican Republic where her work caught the attention of local collectors and galleries. After she moved to Miami where she lives today, she opened her own studio, exhibited widely, and gained significant renown. I won’t recount her many installations, showings, and awards, they’re in her CV on her website. While I favor her oil paintings, especially portraits she did some years ago, like any true artist, she has evolved and works more in mixed media and sculpture today. Nevertheless, her art retains semblances of the past. The warm breezes and colors of the Caribbean flow through her sea-creature-like installations and if you listen closely you can hear the staccato beat of Miami’s South Beach in her twisted wire and metal sculptures. Yet, maybe it’s just me, but I can sense those dark swaths of passion too, just under the surface. I remember the first time I met Marilyn Suriani. I was instantly taken in by the diminutive fireball. Marilyn wore a cloud of black curls around her head and a smile on her face that hinted at her wry sense of humor. She was everything I thought a photographer should be—and that was before I saw even one of her photos. As soon as I could, I searched for her works on the web and learned Marilyn is very well known, particularly around Atlanta, for her business portraits, many of which grace annual reports and, I imagine, corporate boardrooms. Her photos, as any artist would expect, speak volumes with their two dimensional mouths. Having had the opportunity to meet face to face with a couple of her subjects, I knew Marilyn had created not only a fine, well-lit, and complimentary portrait, but also had captured the essence of the person in the photo. One is a proud US Congressman with a history of fighting for civil rights, rendered in black and white, of course. Another is a hard charging state-of-the-art technology company CEO who’s smile and setting—a soft focus garden background—reveal his easy-going manner. Soon, I was fortunate to see more of Marilyn’s work. 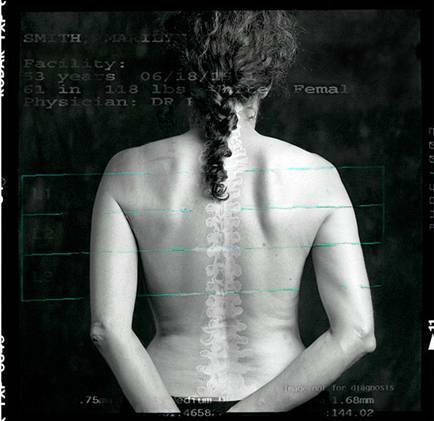 Her photos hang in the Atlanta Airport and selected photos from her documentaries on storefront churches, exotic dancers (Dancing Naked in the Material World), and women in prison are viewable on her website. There is considerable similarity between photography and creative writing. Both represent attempts to capture the world around us, one with light the other with words; while photojournalism may be a combination of the two. I’ve not yet attempted anything quite as ambitious, but I am inspired by the concept and Marilyn’s capabilities. Once she told me, “don’t worry, everyone takes the same shots”. Something distinguishes her work, though, something that appeals to me, and that, so far, is just beyond my reach. But I’m not giving up.